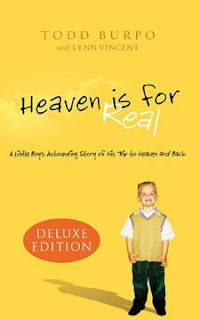 This book is a really sweet account of heaven from a small child's perspective. Oh, to have that child-like faith! In it Colton's father describes his three year old's son's experience in heaven. He claims to have gone to heaven during an emergency surgery to save his life. His details on heaven are quite accurate and match up with many details given in Scripture; things a three year old had not yet been taught. His amazing account of meeting his sister, he didn't know about; and his great grandfather, who passed away before her was born, is very comforting for those of us who have loved ones gone before or possibly even dealt with miscarriages (which was the case with Colton's sister). I have to say, I guess I do have a bit of skeptic in me but regardless, this book is encouraging and gives many reasons to anticipate heaven. Sometimes, I think it is easy for us to get comfortable here on earth, possibly not even long to go to heaven. But heaven should be a place we look forward to, and also want to share with others. I would certainly recommend this book. It was very enjoyable to read.